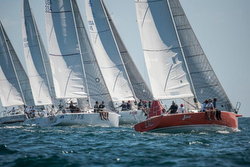 (San Diego, CA)- The 2019 edition of the Helly Hansen San Diego NOOD Regatta is taking place this coming weekend from March 15th to 17th, hosted by the famous San Diego Yacht Club on Point Loma. 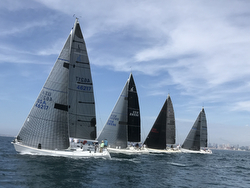 The regatta has become synonymous with the start of the sailing season for most teams involved in one-design and round-the-cans racing in the San Diego region. It is the premiere event to start the season for various J’s; including the J/70s, the J/105s, and the J/120s. The forecast is promising, with temperatures ranging from mid 60s F in the day, with predominantly sunny skies and winds varying from 8 to 15 kts from the West to Northwest. Remarkably, it seems to be a conspiracy to deliver near postcard-perfect conditions ordered up by the local San Diego Chamber of Commerce! Looking forward to such “shorts and shades” weather is the largest class at the event, the fifteen boat strong J/70 fleet with participants from as far-reaching as Guadalajara, Mexico; Miami, FL; and Coeur d’Alene, Idaho. Teams to look for on the leaderboard should be Pat Toole’s 3 BIG DOGS from Santa Barbara YC; Curt Johnson’s AVET 2.01 from California YC; Jeff Janov’s MINOR THREAT California YC; Chris Raab’s SUGOI from Newport Harbor YC; Fabian Gomez-Ibarra’s VAGAZO crew from Coronado, Mexico; and Pamela Rose’s ROSEBUD from Chicago YC. The J/105s are fielding a talented fleet of eight boats with many familiar faces hoping to get a jump on their friendly competitors in their first regatta of the year. Many past SDYC NOOD champions and podium finishers are in the mix, including Jon Dekker’s AIR BOSS, Steve Howell’s BLINK, Stew Cannon’s J-OK, and Chuck Driscoll & Tom Hurlburt’s JUICED. With five boats, the J/120s are all about consistency and who’s showing up for the party with a well-oiled machine in the form of crew- trimmers and tactician! It is never easy to handicap this fleet. Nevertheless, watch for the usual suspects like John Laun’s CAPER, Chuck Nichols’ CC RIDER, Ernie Pennell’s MAD MEN, and Tim Hogan’s SHAMROCK to be fighting for the top of the leaderboard. In the North Sails PHRF Rally, the J/105 VIGGEN sailed by Tom Fisher from San Diego, CA will be looking forward to their Saturday on the water with family and friends. 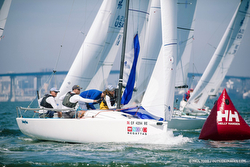 For more Helly Hansen San Diego NOOD Sailing Regatta information Add to Flipboard Magazine.